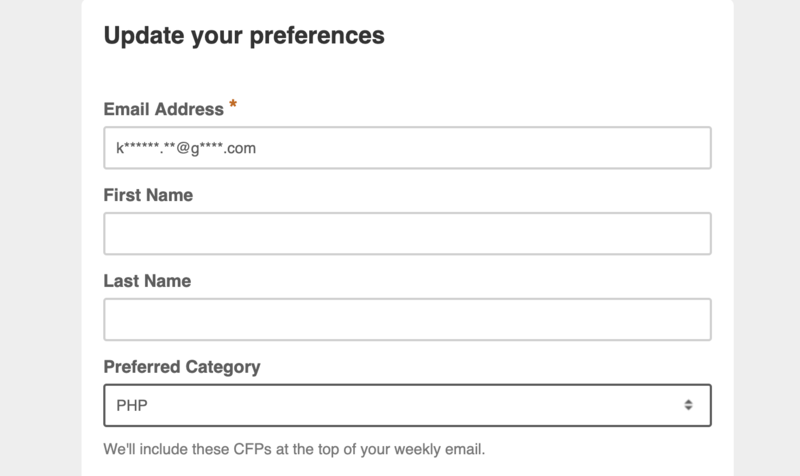 This week, I released three new features to newsletter subscribers that should improve your experience with CFP Land: Category Preferences, 🔔 New tags, and Perks. Location preferences aren’t quite ready yet, but they will be coming soon! Finally, I’m spending extra time each week looking for the “Perks” that each conference offers to speakers (hopefully I’ll be able to automate this eventually). This was another highly requested feature, and it definitely helps if you’re trying to prioritize conferences that will cover travel or hotel costs for you. Travel meaning that the conference will pay for your travel to and from the event. Hotel indicates that the conference offers reimbursement for hotel costs. Stipend is an offer for payment or extra cash to cover miscellaneous expenses while speaking. Not many conferences offer this, so it’s nice when they do! Because my resources are limited, I only include these perks when they are clearly listed on the conference’s website page for speakers. If I miss something, you can always email me to let me know. Also, I decided not to include whether a free ticket for the event was included because almost every conference includes this by default. That’s it for this month’s new features. All new subscribers are asked to fill out a feedback form, so if you’d like to see improvements, keep an eye out for that email after you subscribe or contact me ([email protected]) to start a conversation.